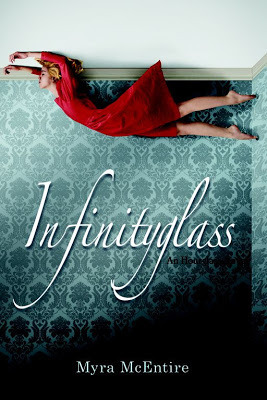 Alison Can Read: GIVEAWAY: Infinityglass Book Birthday! Myra McEntire has had her nose in a book since she could hold one. She was once caught reading in the shower (true story) and only stopped when her father disconnected the hot water heater. 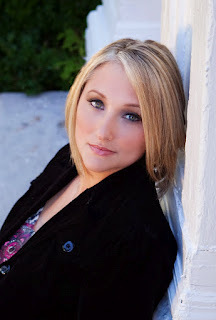 She lives in Nashville, Tennessee, with her husband and two boys. 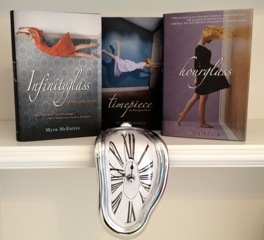 Enter to win the entire Hourglass series!! Plus a supercool melting clock! Huge thanks to Media Masters Publicity and EgmontUSA. Only open to US residents. That melting clock is SO COOL! Love it. I think I'd travel back in time to spend more time with my grandparents, who were awesome people. Miss them! If I could travel in time, I go back to either the late 1800's or early 1900's. I really love dhow back then men had honor and families were still together. I'd go to a few places. First of all my friends say I would be a perfect Southern Belle, I got the Southern part down now all I need is the time period. Also I would love to go to the Victorian or Edwardian era. I would go back to July 27 1974 when at 18, I married my first husband and dropped out of college. He turned of to be abusive and although I finally returned to college he made it very hard for me--physically and emotionally. I often went to class with black eyes. When he almost strangled me to death, I left. But I still feel the scars. I LOVE the Dali-style clock. Great prize. If I could travel in time I would probably go far, far into the future to see what things are like and how technology has changed. I think that would be really cool and really interesting. How is it I have never heard of this series? It sounds like something I'd really enjoy! I would either go back into the Victorian age because I love that style clothing or forward to the future to see how we have evolved. I would probably travel to some point while I was in college to prevent myself from making one of my stupid decisions. They were minor, but they still kind of bother me. The Library at Alexandria in Ancient Egyptian times, because that part of History just fascinates me! The roaring 20s so I can party with Gatsby.